Bonhams announced a 1932 Bugatti Type 49 Roadster by Labourdette as an early highlight for the Greenwich Concours d’Elegance 2017 Sale in the USA. 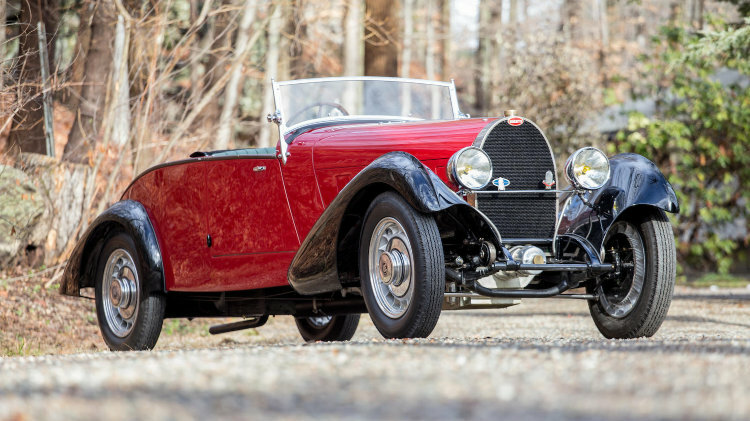 A well documented, matching-numbers, expertly restored 1932 Bugatti Type 49 Roadster with coachwork by Henri Labourdette is an early highlight announced for the Bonhams Greenwich Concours d’Elegance Sale that will be held near New York on 4 June 2017. Bonhams will hold its tenth anniversary Greenwich Concours d’Elegance Sale on 4 June 2017. Bonhams’ annual Greenwich auction is hosted in concert with the delightful Greenwich Concours d’Elegance. Taking place just 30 miles outside New York City on the lovely waterfront Roger Sherman Baldwin Park in Greenwich, Connecticut, the weekend event is the Northeast’s most respected concours. Furthermore, Bugatti is this year’s featured marque so aficionados of Ettore Bugatti’s designs will have much to admire. An expertly restored 1932 Bugatti Type 49 Roadster with coachwork by Henri Labourdette will be one of the highlights of the Bonhams Greenwich 2017 sale. This special rendition, chassis number 49534, was supplied new to Parisian dealer Lamberjack and after a series of sympathetic owners came to be in the ownership of the current steward in 1995. After an exacting, multi-year restoration, this alluring and sporting motorcar is ready for new journeys. True to the legendary spirit of Bugatti, the Type 49 Roadster embodies elegance, performance, craftsmanship and that special joie de vivre. It presents a rare opportunity for connoisseurs of the finest pre-war coachbuilt automobiles. By the early 1930s Ettore Bugatti had established an unrivaled reputation for building cars with outstanding performance on road or track. Indeed, the world’s greatest racing drivers enjoyed countless successes aboard the Molsheim factory’s products and often chose them for their everyday transport. Although Bugatti is best remembered for its racing models, most of the 6,000 or so cars produced were touring cars of sporting character. Considered by many to be the ultimate expression of Bugatti’s original design, the Type 49 model debuted at the Paris Salon in 1930 and was produced for just four years. The Type 49 would be the last of the maestro’s eight-cylinder, single-camshaft touring cars and is believed by many to be the finest of all Bugatti models. A civilized grande routière to match those of rivals Delage and Delahaye, the Type 49 attracted coachwork of the foremost quality, executed in a wide variety of styles by both the Molsheim factory and by other coachbuilders throughout Europe, such as this exquisite and distinct example by Henri Labourdette of Paris. Thus far, 2017 has been a good year for classic Bugattis with Type 57 cars sold for over a million dollars at Scottsdale, Paris Rétromobile and Amelia Island and a further Type 57 prototype on offer at Villa Erba. A 1925 Bugatti Type 35 Grand Prix also sold for a model record $3,30,000 at Scottsdale 2017. Type 49s usually sell for below a million dollar but he car on offer at Greenwich should be helped by Bugatti being the feature marque at the 2017 Concours d’Elegance.